As an engineer, my skills tend to lean toward the analytic, verbal, and logical sides. But as an educator, I've come to realize that students learn best with visuals, so I've been forced to exercise my artistic side … as best as I can. In that light, I created an infographic about solar power to share on Earth Day. While an infographic does a decent job of explaining "what," it doesn't provide enough detail to explain "why." For those who want more than a superficial understanding, here's an explanation of solar power as it travels from the sun to your home appliances. Earth's orbit around the sun is elliptical, not quite circular; the average distance between the two celestial bodies is about 93 million miles (150 million km), also known as one Astronomical Unit (AU). 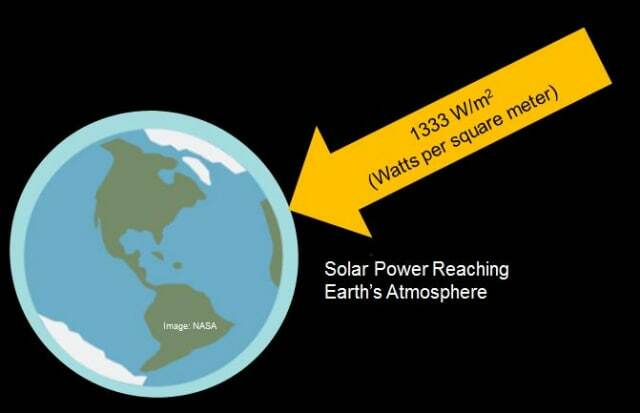 Photons spend a little over eight minutes traveling from the sun to the Earth, and when they arrive at the outer edge of our atmosphere, these tiny bundles of pure energy deliver 1333 Watts (1.333 kW) of power per square meter of atmospheric surface. Power is the rate at which energy is converted, delivered, or expended. One Watt of power is one Joule of energy per second. Earth's atmosphere absorbs and scatters some of that light; by the time it reaches our planet's surface, the photons have lost nearly 25% of their potency, leaving us with 1000 W/m2. 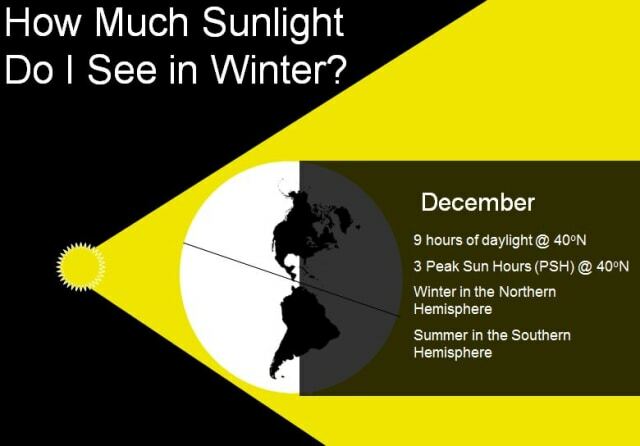 This figure is really an average, as it depends on the sun's angle in the sky, which is affected by the time of day, time of year, and location on Earth. 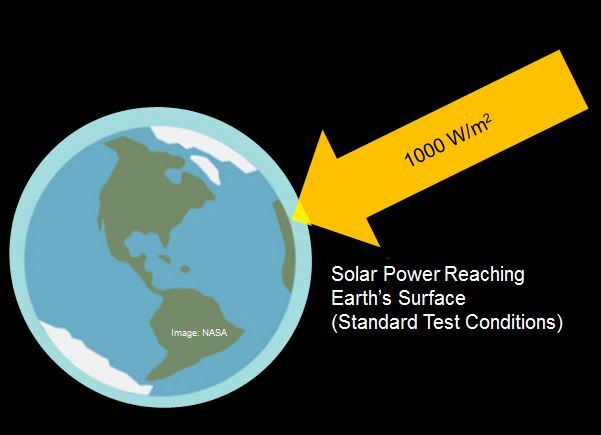 In the solar industry, 1000 W/m2 is considered one of the "Standard Test Conditions" (STC). When you read the power rating of a solar panel, it's specifying the amount of power that the panel will deliver under Standard Test Conditions. Other factors in the STC include cell temperature (25oC) and air mass (1.5). Cell temperature is the temperature inside the panel, which is quite a bit higher than the ambient temperature. Solar cells work better when cool, so the power output will decrease as the panel gets warm. In that respect, we would expect our solar panels to work better in the winter than they do in the summer. All other things being equal, that's true. But all other things are not equal, as we'll see shortly. Air mass refers to how much of the atmosphere the sunlight has to penetrate before reaching the panel. 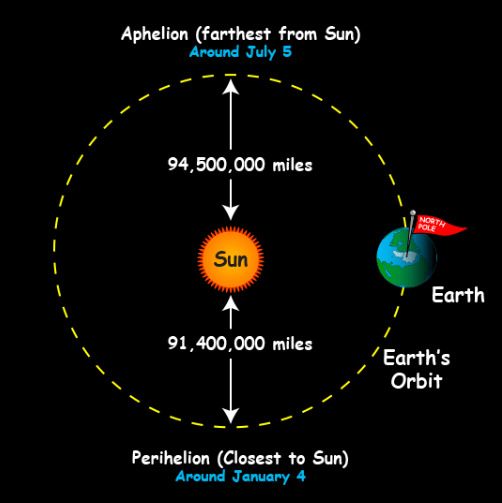 If the sun were directly overhead (i.e., at its zenith), as it is at solar noon on the equator during the Spring or Fall Equinoxes, then the air mass is one. As the sun's angle in the sky gets lower, its photons have to fight their way through more atmosphere, leaving them less energetic upon their arrival. So even though solar panels work better in cold weather, the sun appears lower in the sky in the winter than in the summer, resulting in a larger air mass. The two effects work against each other. Everything is a trade-off. Standard Test Conditions don't represent a best-case scenario, but they are somewhat optimistic. 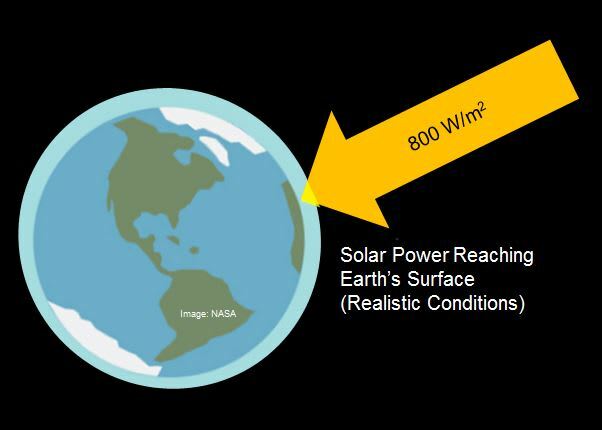 For a more realistic estimate, many PV designers assume that the power reaching a solar panel is about 800 W/m2 when projecting a solar array's performance. 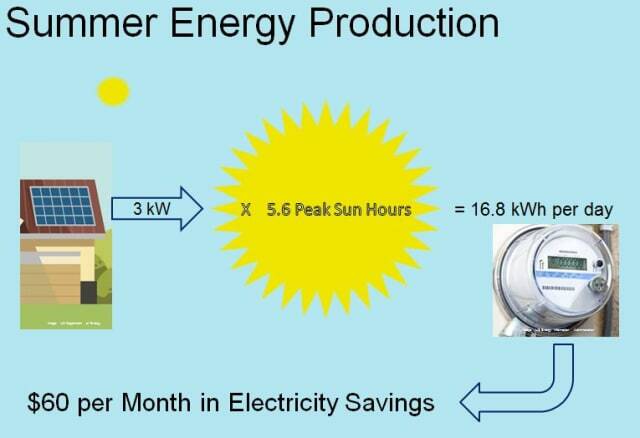 The great thing about solar power is that the "fuel" - sunlight - is free. The bad news is that solar panels are not particularly efficient at converting light into electricity. Most of today's consumer-level PV systems - from the solar panels through the associated electronics - are between 15% and 20% efficient, so as each square meter of solar panel absorbs 800 Watts, only about 150 Watts turn into usable electricity. That's enough to power about fifteen LED light bulbs or one typical LCD flat-screen TV. 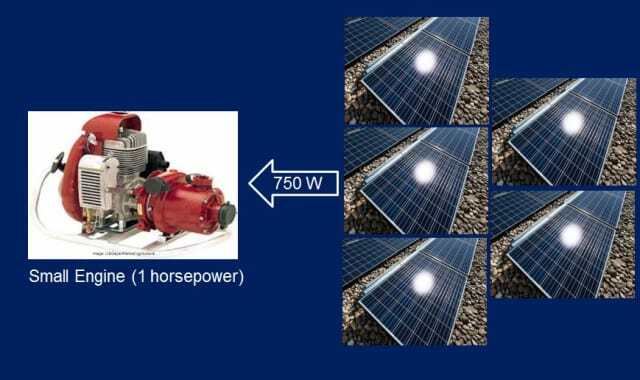 And if you want to use solar to power something mechanical - a car, for example - then you may be disappointed to learn that 150 Watts is only about one-fifth of a horsepower. That's why "solar cars" are solar-assisted, not solar-powered, electric vehicles. On the homestead, a typical photovoltaic array may have a rating of 2000 to 5000 Watts (2 kW to 5 kW). Again, those numbers represent Standard Test Conditions, so they should be derated before making estimates of solar production. Taking that into consideration, let's say the average array is about 3 kW. Since most houses are already on the electric grid, rooftop PV systems are often grid-tied, which allows consumers to buy electricity from the grid at night, on cloudy days, or any other time that the home requires more power than the solar panels can produce. The good news is that with net-metering agreements, the utility will buy your excess power, usually at retail rates, which offsets the cost of occasional power purchases. Excess production frequently happens around midday, when solar panels are generating a lot but the house isn't using all the power. On the other hand, utilities are starting to fight against net-metering laws, and many are imposing "time of use" pricing. These factors, coupled with the rising number of choices in home energy storage, are prompting many consumers to add battery backup units to store excess energy. 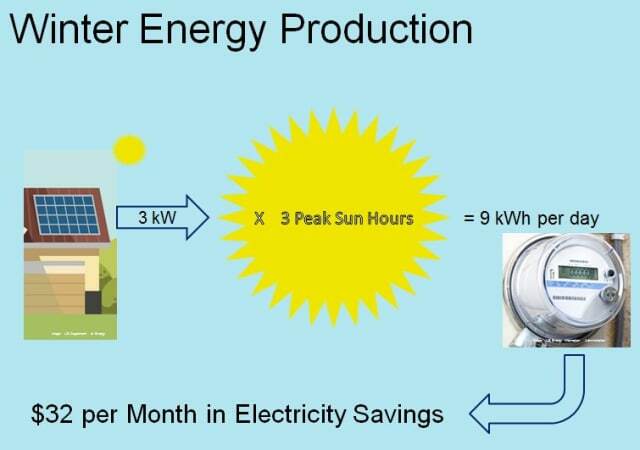 At the time of this writing, the cost of a residential PV system without batteries is around $3 per Watt, including materials and installation. That price has been dropping steadily over the past few years. Today, a 3 kW system will cost around $9000. That doesn't include discounts, incentives, and subsidies offered by the federal, state, and local governments. Some utilities offer rebates to customers who install solar. Why? Because as the demand for energy grows, power companies have to build more power plants, and those are really big capital investments. It's in the utility's best interest for you to generate some of your own power. The payback period for a PV system depends on the system cost (with subsidies), one's electric rate, and the amount of energy that the system produces. Because these factors vary widely with the region, payback can take anywhere from 10 to 20 years. The good news is that solar panels last a good 30 to 40 years. They degrade a little over time, but they are extremely reliable and durable. It turns out that a Joule is a pretty small unit of energy, and nobody thinks about how many seconds their TV set is on, so electrical energy is measured in watt-hours (Wh) or kiloWatt-hours (kWh). Notice that it's still a unit of power multiplied by a unit of time. We know what the array will produce under "realistic" conditions, but those conditions assume that the sun is relatively high in the sky. From a given point on Earth, the sun appears to rise in the east, reach its highest point at solar noon, and set in the west. During that time, its angle of elevation, and the resulting air mass, varies. 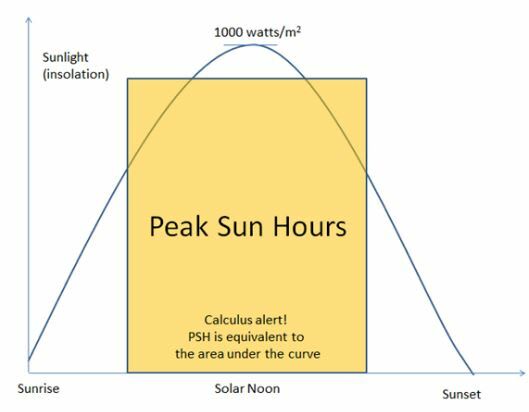 In order to produce reasonable estimates of solar energy, scientists developed a unit called the Peak Sun Hour (PSH). Simply put, PSH averages out the total sunlight at various intensities throughout the day, applies a basic function of Integral Calculus, and determines the average. Good news, everyone! You don't have to understand Calculus to determine an array's energy output! Engineers at the National Renewable Energy Laboratory created tables of PSH data for different locations in the US, taking into account latitude, climate (such as average cloudiness over the past 30 years), and factors related to the solar array itself. PV designers use these tables to estimate the amount of energy that an array can produce at a given location. If the Earth's rotational axis were exactly perpendicular to its orbital plane, we wouldn't experience seasons and the planet would have evolved quite differently - it's possible that humanity wouldn't even exist! 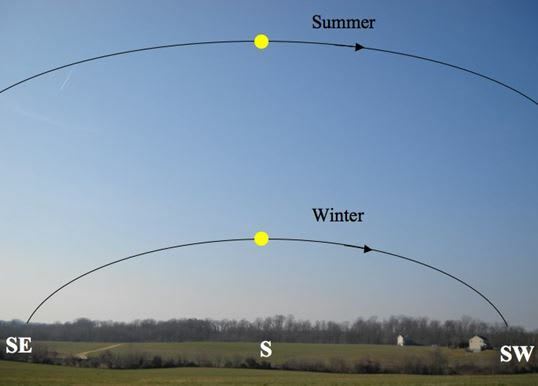 Because the axis is tilted 23.5 degrees, Earth's northern and summer hemispheres take turns pointing toward and away from the sun, giving each half of the planet its respective summers and winters. 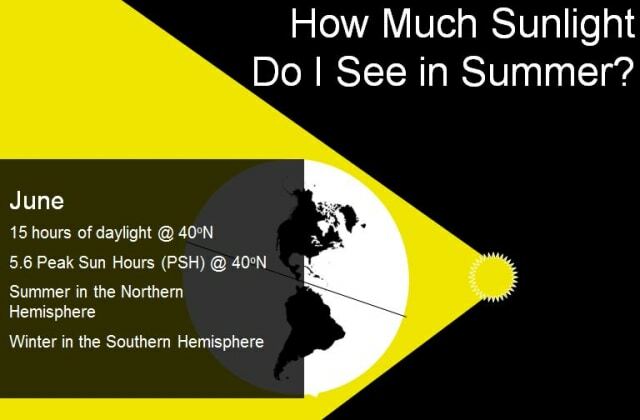 A typical location in the temperate zone of North America might get 5.6 peak-sun hours in June, thanks to 15 hours of daylight and a favorable sun angle. The US average electric rate is $0.12/kWh, so a 3 kW array could generate about $60 worth of electricity in the month of June. A grid-tied PV system will probably put energy on the grid during the summer months. With only 9 hours of sunlight per day and a low sun angle, winter production doesn't fare as well as summer. December's production is just over half of what can be generated in June. In the winter, a grid-tied PV system will probably be purchasing energy from the grid. Tiny packets of solar energy leave the sun, cruise 93 million miles through nearly-empty space, fight through about sixty miles of atmosphere, and reach the surface of the Earth with enough stamina to sustain life. With the proper gear, a fraction of these photons can also power our technology. Earth Day is April 22nd, but let's also remember "Grandmother Sun," the mother of Mother Earth. Click here to download the complete infographic.